My 2011 Ford Taurus Limited AWD recently took me to the garage for some highway-speed vibration caused by a slipped belt on one of my tires. I ended up replacing the rear tires and while the mechanics were under there they found a shock absorber in need of replacing. It was leaking pretty substantially, which I witnessed myself, on the same side as the tire. Now I am searching the internet everywhere for any information I can find about the 2011 Taurus rear suspension such as diagrams of how it's all put together, videos of people DIY-ing the rear shocks, etc. I have come up pretty empty handed except for what I have gleaned from a few posts here on Taurus Club. I've watched a Youtuber "ChrisFix" replace the rear shocks on an old Windstar with ease, but I fear this is not the case with my Taurus. It looks a little more complex when I stick my head under there and I'm debating whether I pay a mechanic the $200 labor to install the new Monroe shocks I just picked up yesterday. Is anyone here able to offer me some advice? I'm a tinkerer, not a mechanic. But I refuse to believe this is as difficult of a repair as it's been made to seem by Firestone. sheila, UKfordguy and Limited413 like this. That appears to be exactly what I need. Hopefully I can bang this out in an hour or two tomorrow. I will update. Thank you for your help. It's surprisingly extremely easy to replace suspension parts. As long as you have a way to lift it, it's like legos. Take out one part after another and then reverse the process with all the new stuff. Here's a couple links. The first one is an install (Not necessarily a tutorial) of coilovers on my car and the setup should be identical to your 5th gen. Second one will be a snapshot of my service manual with instructions and a picture of how to remove the rear shock absorber. The diagram image is kinda crap but it's something. Instructions are the second picture. sheila and Limited413 like this. Excellent information. I feel much more confident. I did not have a chance to do this project, but as soon as I can I will report back the results. Just a heads up, you may need an alignment after replacing your rear shocks. Usually an alignment is needed after doing anything suspension-wise. I managed to get the stabilizer bolt nut off and access the lower bolt on the shock absorber. Removing that was no problem. Then I went to the upper bolt and realized I probably didn’t have the right tools. I used a tiny socket to rotate the shock tower rod while my buddy held the nut in place. I couldn’t figure out any other way to do it, unless I had an 18mm wrench which I don’t. With the wrench and tiny socket I most likely could put this back together but had to call it a night. It wasn’t terribly difficult. I’m just wondering how you properly torque the nut holding the shock tower rod? Am I supposed to have an 18mm torque wrench? I can’t use a torque wrench with interchangeable attachments because there’s no way to hold the shock tower rod in place so it doesn’t rotate. The dust shield on the shocks are a plastic sleeve that cannot be moved aside like some I’ve seen. The parts provided by Monroe with the shock also don’t give me the highest confidence. Ford has this nice rubber grommet that actually provides protection from the shock tower rod hitting against the metal frame because it seats right inside the opening for the rod. The Monroe replacement is just a rubber donut that rests against the metal frame but leaves the rod to press against the frame. I can post some pictures showing the difference. 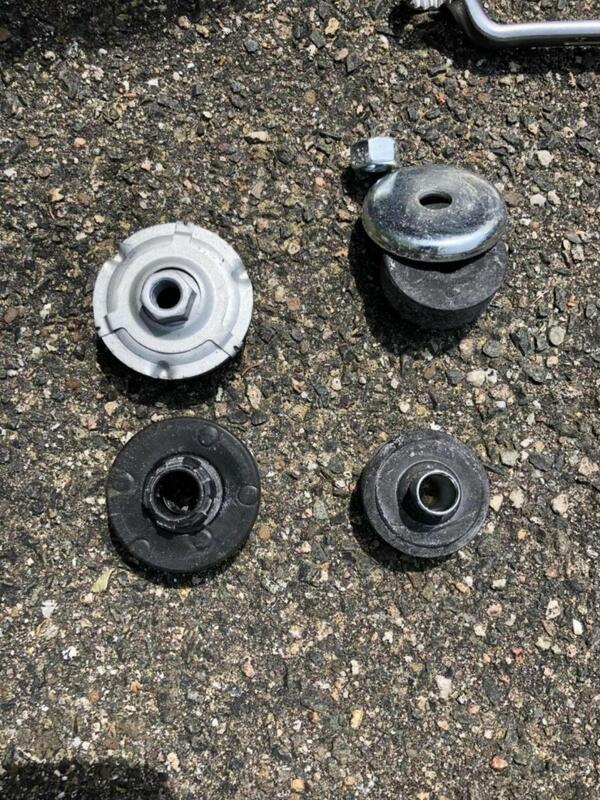 I’m inclined to use the old rubber grommet because it’s in good condition still. I want to thank those that helped me figure out what I was doing. I’m what Harbor Freight Tools refers to as an “avid do-it-yourselfer”, but I haven’t had a ton of experience and everything I got from you guys helped. One of my pics is the new rubber grommets next to the old ones. You can see an obvious difference but they still fit just right. 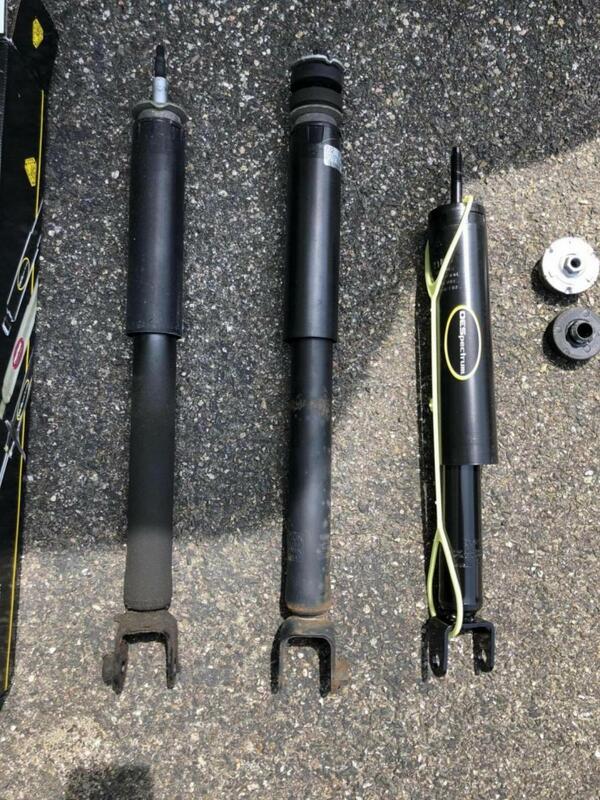 My other picture shows the 2 old shocks and 1 of the new ones. Any guesses which of the old ones was bad? I found that I needed to get some tools that I didn’t already have when starting the job. A 1/2 drive torque wrench and 18mm socket were used to torque down the thick bolt on the bottom of the shock. I had to use the new replacement nut from the kit, the original nut was welded onto the old shock. Not a bad idea to keep it in place. The new nut was 21mm and I used an offset wrench to hold it in place while torqueing the bolt. That worked out nicely. One thing I ran into was that the shock tower kept rotating when I was trying to unscrew it. Eventually I used an 18mm offset wrench to hold the nut, and a 15/32 socket on a 3/8 drive ratchet to unscrew the shock tower (which I actually did by clockwise ratcheting it against the nut). Definitely some uncomfortable angling doing this. To put it all back together I did the shock tower last, kept the control arm supported with a jack. That seemed to work. I hand tightened the new nut and then used a 19mm offset wrench to tighten it. The new nut was 19mm whereas the factory nut was 18mm. Interesting. I didn’t manage to torque this nut. The stabilizer arm required a 15mm closed wrench to undo and re-install. I used a small plier to hold the nut on the back side otherwise it spins endlessly. The nut on the back side was not a 15mm, might’ve been a 16 or 17 but I’m working with a bunch of random tools that I collected throughout the years. Thanks again everyone for your help. I’m onto pads and rotors next. Thanks for posting. I am about to replace my Struts and Shocks...probably go with Ford Motorcraft or KYB. I don't know about anyone else, but working on cars is really satisfying (sometimes aggravating). Working in an office does not offer the same sense of accomplishment. Glad to see this thread helped more than just me. A few lessons I learned after doing this. First off, I ended up buying Monroe OESpectrum shocks from O'Reilly Auto Parts. I got the pair for about $152 online after a $25 coupon. NOT BAD! I was able to torque the lower bolt and nut on the strut, but could not torque the upper bolt/nut because the new strut had a square head on the rod, not one that could be held with a socket like the old one. I used an offset wrench and ratchet to remove the old one as I indicated. I just went with what seemed tight.